-Precision motor, low vibration and ultra quiet design, free it from work noise with only about 50 db. -5-speed fine-turning for the blade. -Light weight and cordless design for easy use. -Titanium blade combining with the ceramic movable blade for efficient and long term cutting. 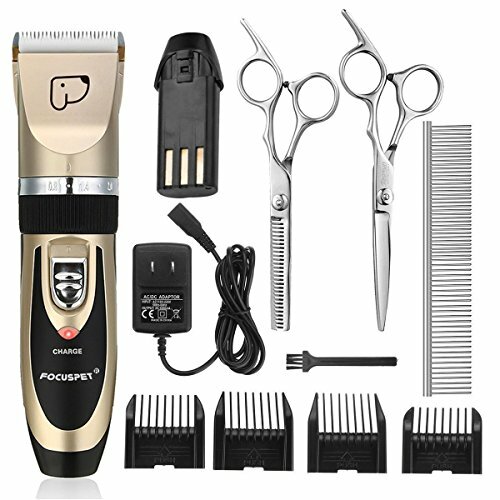 The titanium blade of the pet clipper will not get rusty. It always keeps sharp and ensures high durability. -First time or half of a year no use after you buy, please charge 5 hours before you use.【SAFE & EFFORTLESS PET CLIPPERS】 — FOCUSPET pet grooming clippers will give you a best choice with low price. Titanium blade combined with ceramic blade maintains sufficient sharpness and durability without jamming easily. Besides, specially designed blade protects your loved pets from getting hurt. Powerful motor enables you to trim with ease, not to clamp and hurt your pets. The pet hair clipper is designed to offer you comfortable grip and easy control. 【3mm/6mm/9mm/12mm COMBS】 –This Professional pet grooming clipper cut your pet hair to the length and style that you want. There is a 5-speed tuning dial on the pet clippers, which brings the ceramic blade in and out so you can get the exact length you want. It is light and easy to hold and perfect for green hands. 【CHARGING INDICATOR & SUPER QUIET】 — The LED indicator would show you the power status while charging.Pet clippers for dogs with Precision motor, low vibration and ultra quiet design, free it from work noise with only about 50 db, to help the pet feel at ease, not afraid haircut any more.Detachable blade makes it easy for changing and cleaning,help you to cut thick hair quite smoothly. 【RECHARGEABLE & CORDLESS & LIGHTWEIGHT】 — This rechargeable grooming clippers equipped with a high quality charger and a high capacity detachable li-battery. Lightweight and cordless design for easy use. You can also use the dog clippers with cord when battery power runs out.Light weight and cordless design for easy use. 【AFTER-SALES SERVICE&CONTECT】 — 1 Year Guarantee for pet trimmer! Just contact us if you are not satisfied and we will replace it or issue you refund. ✔KIT CONTENT✔:Clipper, 4 Black attachment combs(3mm/6mm/9mm/12mm), Grooming comb, 1 Cutting scissors, 1 Thinning scissors, Cleaning brush, US adapter, User manual. Please NOTE that the OIL for blade is NOT included in the package due to shipping logistics.